The Right Amount of Simple — Slugline. Simply Screenwriting. I find that the products and services I love using most are those that aspire to that rule. So by Einstein’s measure, as these products and services strive for—and just slightly miss—that just-right simplicity mark, they can have two kinds of “failures”: being still yet too complicated, or being a little too simple. Double-click for next track, triple-click for previous; double-click-and-hold for fast-forward, triple-click and hold for rewind. Clever, but I don’t think most people will discover these shortcuts without reading about them, and most people won’t read about them. The Onion even weighed in. The next iteration of the iPod Shuffle brought back the buttons. The first writing software was so non-simple that it wasn’t even called writing software. “Word processors” could only show you plain, monospaced text on a monochrome screen. You couldn’t know how it would appear in print until you tried. The push to simplicity in word processors was borne on the back of a concept called What You See Is What You Get, or WYSIWYG (pronounced whizzy-wig). Apple was at the forefront of bringing this power to the consumer. The Macintosh was the first home computer that could display proportional fonts. When your text can float around in boxes and flow across columns, you, the writer, have a whole new playground of distractions. You’ll spend an afternoon picking fonts, because why wouldn’t you? The best writer in the world could have their manuscript evaluated based in part, if only subconsciously, on their abilities as an amateur typographer. WYSIWYG also means that formatting and styling of text is rendered accurately on the screen. What a wonderful and seemingly unassailable innovation. Want some text bold? Select it and choose Bold from some menu somewhere. Or press a little B button. Or press a keyboard shortcut. The cues within the document that mark that text as bold are hidden from you, and all you see is the accurate preview of what your work will look like printed. Wonderful, right? Have you ever struggled to add or remove items from a numbered list in Microsoft Word? Or wondered why changing the margins of a paragraph right after a page break also affects the paragraph just before? Have you ever made some text bold at the end of a line, pressed Return, and then typed an entire bold paragraph before realizing your mistake? Or lost formatting when moving your writing from one application to another? It has taken us a while to realize it, but WYSIWYG is too simple. It hides from the writer the very work they’re doing. It’s an iPod without buttons. But WYSIWYG is also not simple enough. That menu with Bold in it? There are a dozen other options there too. And when you’re reaching sorting through them, you’re not writing. You’re mousing. That button bar with the little bold B? How many other buttons are there up there? Do you even know what they all do? Does one of them have a floppy disk on it? When was the last time you saw one of those? 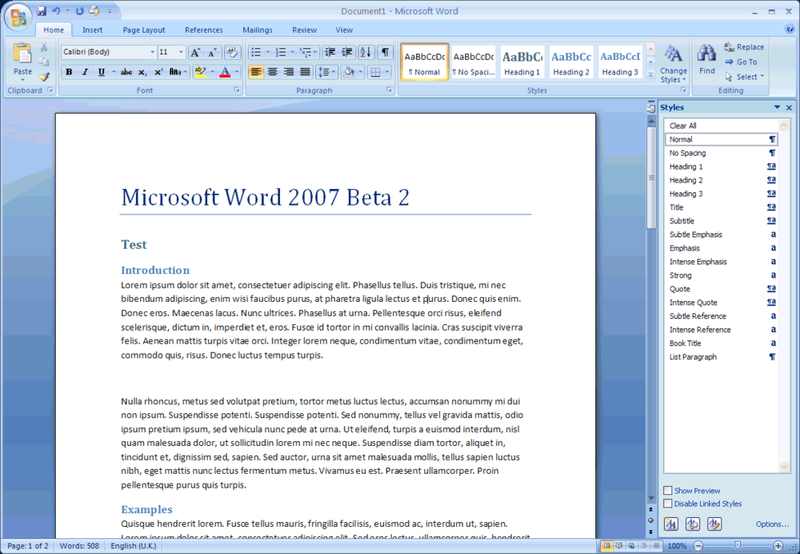 Microsoft Word 2007. Intense Reference. Worst of all, your writing is now locked in a file format that may or may not be understood by another application. Are you confident that you'll be able to open that file in ten years? Over the last several years, an innovation has been taking over the web writing world. This innovation was borne on the back of Markdown, a plain text markup language created by John Gruber. The innovation? Abandoning WYSIWYG. With Markdown, most writers find themselves right back where we were before the Macintosh: writing in plain text, often in a monospaced font. At first, this seems crazy. But once you try it, you realize that it solves both the too-simple as well as the not-simple-enough problems with WYSIWYG. No button bar is needed. You do everything with text, including creating headers, bulleted lists, and styled text. Your hands never need to leave the keyboard. On the other hand, you get to see all the mechanics of the text you're creating. When you italicize text, you see it wrapped in asterisks. You see the pound signs that mark headers. But this little bit of extra UI complexity removes a ton of UX complexity. Now you can create a header without touching the mouse. Now you can italicize text from your iPhone. And your files are the very same text files that computers have been able to work with since day one. You could write in Markdown on a Commodore 64 if you had a way of getting at the files. But most importantly, with Markdown, there's nothing for you, the writer, to concern yourself with except the writing. Markdown is just the right amount of simple for writers. John August and I created Fountain because we wanted that same experience for screenwriting. So as you look at Slugline—and possibly find yourself surprised by the visible scaffolding that allows a screenplay to be created in plain text—Clint and I humbly ask that you see past the apparent increase in complexity. What lies beyond it is a much simpler movie writing experience. And we think you're going to love it.